This page is a collection of early British 4" (10.2 cm) breech loader bag guns from the late 1800s. These guns shared common characteristics including weak design and few of them survived in active service after 1900. A few of these guns were converted to QF guns in the 1890s. As detailed information for these guns is limited, rather than creating a page for each one, I have decided to combine them into a single page. These guns were not in the main 4" (10.2 cm) series and represent some of the last of the short-barrel black powder guns built for the Royal Navy. Used only in a few minor vessels. Withdrawn from active service after a 6" BL Mark II of similar construction on HMS Cordelia exploded in June 1891, killing six crewman and wounding thirteen. Construction was steel 'A' tube, wrought iron jacket, trunnions and 'B' coil. Not chase hooped. Cup obturation was fitted with a radial vent. Actual bore length was 14.8 calibers. A total of 19 guns were manufactured. Mountings were RCDI with an elevation range of -8 to +12 degrees or VBII of -30 to +20 degrees. Range was 5,500 yards (5,030 m) at a muzzle velocity of 1,180 fps (360 mps) and an elevation of 20 degrees with a 25 lbs. (11.3 kg) projectile. Similar to the 13cwt Mark I, but was 25 calibers long and weighed 22.5cwt. 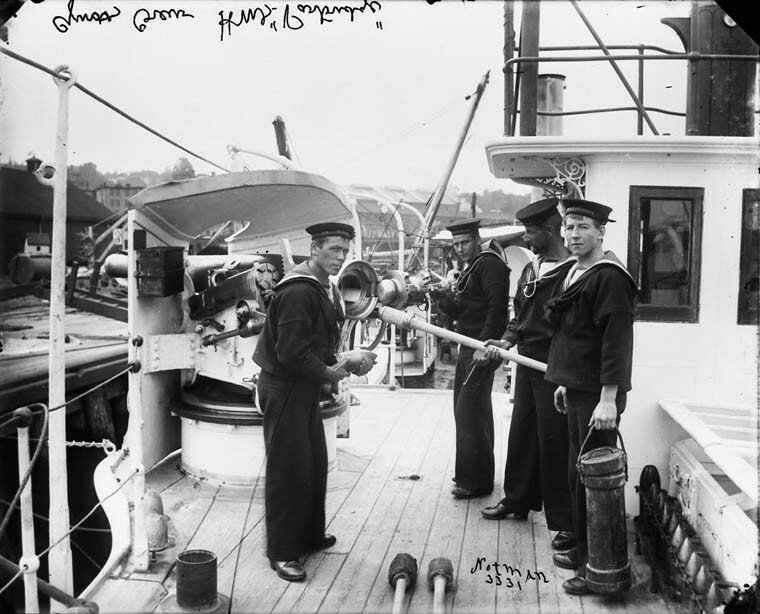 Twenty-seven guns were manufactured, of which eight guns were mounted on HMS Swiftsure. All of them were withdrawn from service after the HMS Cordelia accident. Mountings were VBI with an elevation range of -28 to 18.5 degrees. Muzzle velocity was 1,790 fps (546 mps) with a 25 lbs. (11.3 kg) projectile which gave a range of 7,200 yards (6,580 m) at maximum elevation. Not entirely certain, but this may be the 4"/25 (10.2 cm) Mark I. Photograph courtesy of Dave Perkins. 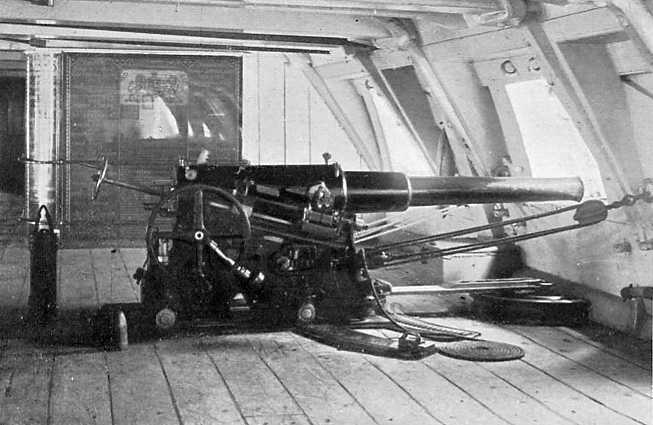 4" (10.2 cm) gun on the gunboat HMS Partridge ca. 1895. Note the 4" (10.2 cm) shells in the ready rack at lower right, the three motion breech, and the powder casing. Notman Studio of Halifax/Library and Archives Canada Photograph PA-028424. These were all steel trunnion guns differing in minor details of construction and using de Bange obturation. These guns were mounted in many of the old battleships of the mid-1800s, including HMS Inflexible which had eight, and in gunboats. Mark II was not chase hooped while Mark IIP differed in having percussion instead of friction firing. Mark III was not chase hooped and was rebuilt as Mark IIIA with a 'B' tube to the muzzle in front of the original 'B' tube. Mark IV had a heavier 'A' tube and was never chase hooped while Mark V was built with a row of four chase hoops. Mark VI was similar to the Mark IIIA with a 'B' tube to the muzzle. All used three motion breech mechanisms. Weight ranged from 1.30 to 1.35 tons (1.32 to 1.37 mt). Overall length was 120 inches (3.048 m). A total of 53 Mark II, 20 Mark III, 67 Mark IV, 106 Mark V and 61 Mark VI were manufactured. Of these, 11 Mark V and 40 Mark VI were used for on over-bank carriages for land service, mainly in India. These should not be confused with the 30-pdr field gun, which was also a 4"/27 (10.2 cm) and only used in India. Mountings were VBII in battleships and a few gun boats while Swiftsure retained her VBI. All of these had an elevation range of -2.8 to 18.5 degrees. Other ships used VCPI mountings which had an elevation range of -20 or -14 to +20 degrees. Charges were 12 lbs. (5.4 kg) SP or 3.06 lbs. (1.4 kg) Cord 5 which gave a muzzle velocity of 1,900 fps (579 mps) and 1,903 fps (580 mps), respectively, with a 25 lbs. (11.3 kg) projectile. Range was 7,700 yards (7,040 m) at an elevation of 20 degrees. "British Naval Guns 1880-1945 No 17" article by John Campbell in "Warship Volume X"